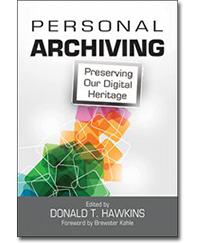 Editor Donald T. Hawkins and 15 experts elaborate on the emerging field of digital archiving for home users in their book ‘Personal Archiving – Preserving Our Digital Heritage.’ Hawkins also presents MailStore Home for the secure storage of email. We asked him how the book came about and specifically why our free email archiving and email backup software is worth recommending. Where did the idea for the book ‘Personal Archiving’ come from? Digital data are fragile and perishable and preservation is one of the most important reasons to undertake an archiving project. That consideration led eventually to the publication of Personal Archiving: Preserving Our Digital Heritage. Who is the intended audience of the book? Information professionals, archivists, historians, librarians, and anyone with a mass of data they would like to organize and preserve. The fourth chapter, ‘Software and Services for Personal Archiving,’ covers email archiving. Why is it necessary to back up emails? I think emails are worth backing up because they provide a unique vantage point and allow one to see what the writer was thinking, his/her emotions, as well as an insight into their thought processes. You don’t get this with other types of documents. Emails are also good for preserving a record of events and what led up to them. I mention some of the reasons on page 64 of my book and also refer to this site which has some other good reasons. I also think the example of the British Library paying about $51,000 for the e-mail archive of the poet Wendy Pope shows that it is valuable to keep e-mails. MailStore Home is a software application intended for private users. How did the solution win you over? It’s free, can handle emails from many different platforms, and provides a good search capability. Editor Donald T. Hawkins is a writer, blogger, speaker, and long-time information industry observer whose distinguished career included 15 years in the AT&T Bell Laboratories Library Network, where he was honored for his pioneering contributions in end-user searching. He is the author of hundreds of articles and a two-time winner of the UMI/Data Courier Award for excellence in writing. A free extract (PDF) of the book is available on the Information Today Inc. website.